Today, James offers us his unique critical perspective on Katy Perry. It should surprise no one that James is a grammar Nazi. I’ve also got some announcements for you. First of all, I will be discontinuing the Subscribers’ Edition in its current incarnation effective August 31st. My current subscription service provider takes a sizeable cut off the top, and doesn’t offer much in the way of archive organization, so I’m going to look into alternative ways of providing you with bonus content. The new SCSE will offer improved presentation and delivery at lower prices. And in the meantime, I continue to offer sweet (free!) bonuses at the Sketch Comedy Facebook page. Second, you may have noticed a conspicuous absence of the Sketchy Activity Daily. More often than not, I found myself drawing the dailies on my lunch break at work, which cut into my prime time for drawing the actual comic strip. While it was an interesting undertaking, after three weeks, I found that it was too much work to keep up with. Much as I’d like to draw silly things for you every day, it’s not feasible at this point–so I continue looking for ways to make it work in the future. We’ll be back to our usual Tuesday-Friday schedule next week. In the meantime, I’m going to see Captain America this weekend! I’m not planning to write a review of it, but if you want one, I would be glad to gratify your every whim. I’m not even kidding, your whims are awesome. 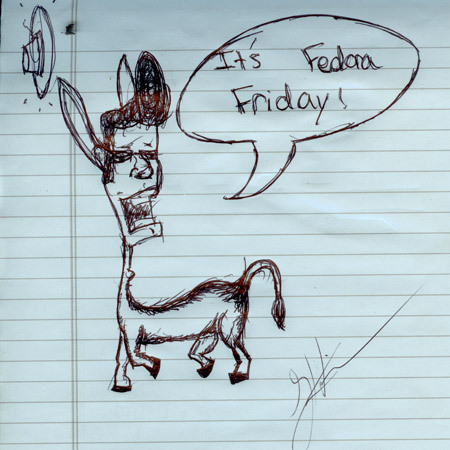 One of the warehouse guys, Garrett, drew the following caricature of me, celebrating Fedora Friday. In retribution, I drew a caricature of him. 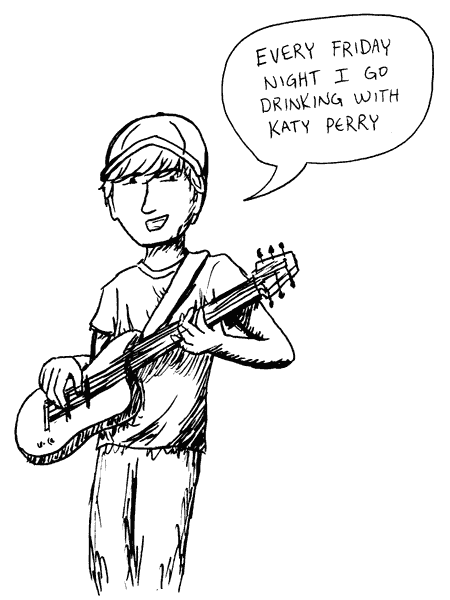 Sketch Comedy does not endorse going drinking every Friday night–or, for that matter, Katy Perry. See you tomorrow with a new comic strip!